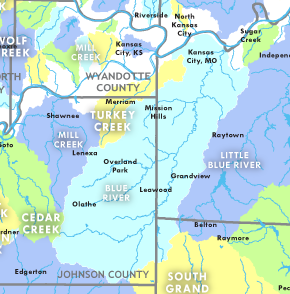 The Blue River is a tributary to the Missouri River. Predominantly urban along the main stem of the Blue River. Farming and agricultural land uses are found near the headwaters in Johnson County, Kan.
Bacteria, elevated nutrients, dissolved solids, hydrocarbons and other trace elements from both point sources (such as wastewater treatment plants and manufacturing facilities) and nonpoint sources (such as storm water runoff, leaky sewage lines, septic tanks and atmospheric deposition). The upper watershed contains valuable natural cover such as marsh/wetlands areas, lowland hardwoods, deciduous forest and grasslands. While the watershed’s upper portions are healthy enough to support diverse biological life, aquatic life has declined in the lower watershed areas due to urbanization, declining vegetation, increased impervious surface runoff, increases in nutrient loading and wastewater inputs. A number of city and county parks and trails exist within the watershed and along the stream corridor. Upper portions of the Blue River offer sport fishing opportunities for several species, including largemouth bass, channel catfish, carp, crappie, bluegill and green sunfish. In the late 1800’s and early 1900’s, the banks of the Blue River served as a primary social and cultural meeting point for wealthy members of the Kansas City community. The Blue River was used for recreational and commercial boating purposes in the early years of the 20th century; however, extensive channelization and urban development have degraded the lower portions of the river. Flooding has been a major concern in this watershed since the disastrous floods of 1928 and 1929. A record-setting flood in September 1961 led to a congressional resolution requesting the U.S. Army Corps of Engineers perform a study of the area. Since work was authorized in 1970, approximately $250 million has been spent on channelization and flood control in the lower portions of the Blue River. Flooding continues to be an issue in this watershed due to increased urbanization and impervious surfaces. Stormwater runoff is a major concern within the watershed, as urbanization and urban sprawl have contributed to significant water quality degradation in the Blue River and its tributaries. The city of Kansas City, Mo., has extensively studied the Blue River as part of its development plan to reduce sewer overflow and stormwater runoff into the Blue River. The city filed its plan with state and federal regulatory officials in January 2009 and will begin implementation later in the year. The U.S. Army Corps of Engineers are currently working on channel improvements in the middle portions of the Blue River near the confluence with Brush Creek to 63rd Street.